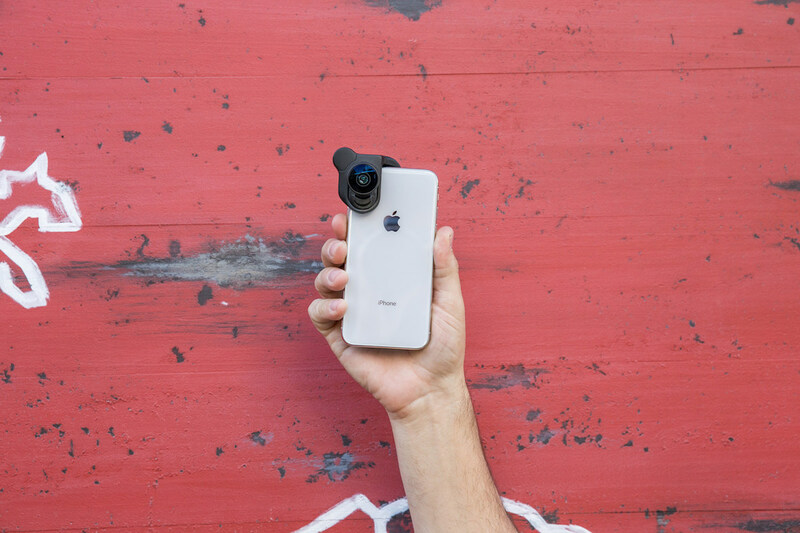 Olloclip today announced an all-new mobile lens system that is designed exclusively for Apple's iPhone X. With the lens, iPhone X owners can enhance their field-of-view and shoot "wider and closer" than the iPhone's built-in camera. Super-Wide: Four-element lens with more than 120° visibility. Ultra-Wide: A 155° action camera field-of-view. Fisheye + Macro 15x: Unique 180° wide-angle spherical effect + 15x increased magnification. Telephoto: 2x optical zoom to get twice as close to the action. Macro 14x + 7x: Get detail oriented and see beyond the naked eye. Macro 21x: Go in for the ultimate close-up. There are numerous new features unique to the iPhone X system, including an expanding lens mount that allows for Olloclip to be screen protector compatible, as well as align with both the iPhone X's front and rear cameras. The system has a pendant stand designed to carry the set, also doubling as a pocket-sized tripod. In addition to the iPhone X lens system announcement, Olloclip is updating its single lens system for the iPhone 7/8 and 7/8 Plus. The new products have a lower price point, interchangeable lenses, multi-element optics, and the ability for users to reach the front and rear cameras by quickly flipping the lens system. Six lenses are individually available: Super-Wide, Fisheye + Macro 15x, Telephoto 2x, Ultra-Wide, Macro 14x + 7x, and Macro 21x. Both the iPhone X and iPhone 7/8/Plus accessories are available to purchase now on Olloclip.com, ranging in price from $59.99 to $79.99. There's also a bundle called the Mobile Photography Box Set for iPhone X with Super-Wide, Fisheye, and Macro 15x lenses priced at $99.99. Apple retail locations worldwide will begin selling the bundle in June. So, can anyone comment on previous ollo-clips? I would love to get one for my X as this is my main photo taker. I've used them on my old 4S and 5S phones. Didn't use them with the 6S though mainly because I didn't want to invest in another accessory that probably wouldn't end up supporting the next phone's form factor. So if you plan to stick with the X for a few years, I'd say it's a worthwhile expense, but if you're likely to upgrade to the next iPhone your Olloclip may only get 6 months of life out of it. Can these be used if a phone is in a case, or would the case have to be removed? You can not use these with a case they form fit around the phone itself. Thanks for the quick response. Unfortunately, that's a dealbreaker for me. It's a shame, too, as I've been looking forward to the Olloclip for the X.